At Impact Trophies & Medals, we offer a huge range of cheap shields, plaques, trophies, and awards suited to any event or competition. Our extensive range includes cheap wooden shields, low cost plastic plaques and affordable glass shields with your logo and engraving. Impact Trophies & Medals are a leading retailer of cheap shields & plaques. Great for personalisation, many of our low cost shields and cheap plaques can be personalised with high quality text engraving and printed logo inserts, to perfectly meet all your sports or social club presentation needs. The Curve Plaque Award is a plastic self supporting shield available in gold, silver or bronze. 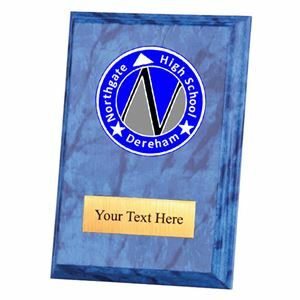 Set within a shield shaped frame, the black based trophy is finished with a gold, silver or bronze edge and a laurel leaf design surrounding a circular space for a printed logo or image insert. The Curve Plaque Award can be customised to suit any sport, activity or awards event. This rectangular walnut veneered The Wessex Walnut Plaque is finished with a polished surface and bevelled edges. The centre of the plaque features a glossy golden circular laurel leaf insignia, within which sits a round frame which can hold a self adhesive logo or image of your choosing. The modern styling of the Westfield Wedge Award features a wedge shaped piece of wood, veneered in an attractive polished Rosewood. A round antique gold motif features on the front, surrounded with laurel leaves. The centre of the motif is designed to be able to display a printed logo insert of your choice, if desired. Made from metal, the Star Metal Plaque is a metal star shaped plaque set upon a shiny black trophy base. Available in a choice of 3 colours, this gold, silver or bronze plaque can be personalised. The star centrepiece is detailed with a star medal decoration. 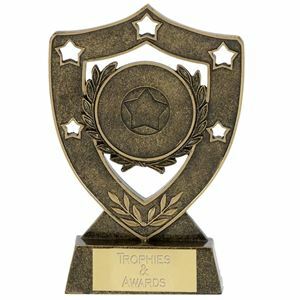 The Cup Metal Plaque is a premium metallic gold coloured metal trophy set on top of a black trophy base. The trophy is shaped like a cup, with metal detailing around the top. Available in gold, silver or bronze.